Beltex sold to 16,000gns and met a keen demand from the commercial sector at the breed society’s premier sale at Carlisle on 15 and 16 August 2013. The sale leader at 16,000gns was the shearling ram Ardstewart Super Mario, sired by the 9,000gns Broughton Pound Stretcher ET and bred by W and A McCrabbe, Lifford, County Donegal. He was knocked down to a consortium comprising J A McGarva, Annan, Dumfriesshire, K and R Buckle, Kirkby Stephen, Cumbria, and N and J McQuiston, Newton Stewart, Wigtownshire. The same breeders took 10,000gns for Ardstewart Swagger Jagger, another Pound Stretcher son, selling to P Slater, Macclesfield, Cheshire. Another by Pound Stretcher, Ardstewart Sony, sold for 6,500gns to M Munro, Lairg, Sutherland. Messrs McCrabbe invested 3,500gns of their takings in the ram lamb Langlands Trojan, sired by the 5,800gns Drumchapel Replay ET and bred by J and S Wilkinson, Richmond, North Yorkshire. A joint call of 12,000gns from J E Collinge, Lockerbie, Dumfriesshire, and P Tippetts, Shifnall, Shropshire, secured the Belgian-bred shearling ram Scooby Doo, imported as a lamb by T J Palmer, Ballymena, County Antrim. Mr Collinge recouped some of his cash, taking 4,900gns for the top price aged ram, the two year old Corra Rambo, a Beachy Perfection son bred by G Forsyth, Castle Douglas, Kirkcudbrightshire. The buyer was W P Evans, Bodorgan, Gwynedd. The reserve champion, Padkin Sugar Daddy went for a bid of 9,000gns to three buyers: J Young, Alford, Aberdeenshire, M Dunlop, Biggar, Lanarkshire, and R and K Williams, Huntly, Aberdeenshire. This shearling ram was by Callacrag Rocky ET and bred by Padkin Beltex, Thornhill, Dumfriesshire. The top price ram lamb at 7,000gns was Artnagullion Top Dog ET from E McAllister, Ballymena, Northern Ireland, and was split in a four way bid from A and V Copland, Orkney, R W Flaws, Orkney, C G Mair and Partners, Turriff, Aberdeenshire, and R and G Brown, Stromness, Orkney. Top Dog was by the 12,500gns Woodies Snoop Dog ET. The reserve female champion was secured for a call of 5,500gns, selling to Paul Tippetts. Kingledores Sapphire ET, a shearling ewe, from R T Wood, Biggar, Lanarkshire, sired by the 5,500gns Clary Prankster ET. 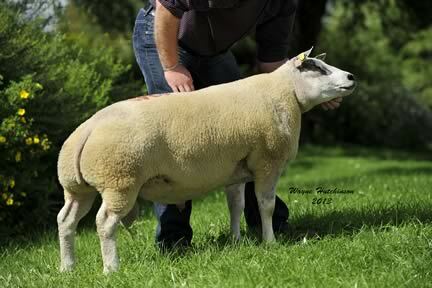 Mr Wood realised 3,400gns for another shearling ewe, Kingledores Spice ET, also by Prankster. She was knocked down to C Birrell, Castle Douglas, Kirkcudbrightshire. Later in the day, the March born ram lamb Kingledores Trojan ET, a Damien V/D Drie Musschen son, went at 4,200gns to E J and A Fox, Wooler, Northumberland. A bid of 4,800gns from Proctors Farm Ltd, Clitheroe, Lancashire secured Rathbone Skye, a Dooley Nissan daughter, consigned by M R and J E Davis, Austwick, Lancashire. Ardstewart Paparazzi sold for 3,500gns to D Thornley, Swadlincote, Derbyshire. Bred by Messrs McCrabbe and entered for sale by G and A Shanks, Carluke, Lanarkshire, this three year old ram was by Castlemeadow Nijinsky. Averages: 187 shearling gimmers, £580.21; 150 ram lambs, £1,061.13 (up £104.66 on 2012); 10 aged rams, £1,879.50 (up £734.05 on 2012), 505 shearling rams, £879.39.